I have been fascinated all my life with dinosaurs and their depiction in drawings, paintings, fiction and non-fiction. I have a calling card I hand out that says "I collect anything concerning prehistoric animals, especially children's books, historical documents, science fiction, paper american, museum guides, art, sculpture, and antique toys." Illustration from "The Enormous Egg"
"It all started when I was five. My father used to take the family to the American Museum of Natural History, where I'd gape at the gigantic dinosaur skeletons and run to the bookshop for souvenirs. Then my father took me to my first movie, The Beast from 20,000 Fathoms. I was so excited that when the dinosaur finally appeared on the screen I threw up. I soon found the word 'paleontology' in the dictionary and started using it to amaze my friends. Ends of the Earth, by Roy Chapman Andrews, told me just how to find dinosaur eggs in the Gobi desert. By this time I had a dinosaur fever of 105 degrees. "Although I have not chosen paleontology as a profession, my interest in man's fascination with prehistoric animals has never waned. I correspond with 300 rare book dealers, and advertise in antiques and collectibles magazines. I gather up duplicates to trade with fellow collectors. On a slow day I'll even write dinosaur limmericks, or coin words like paleophily and sauropodiatry. I guess you could say I'm a . . . DINOSAURABILIAC!" 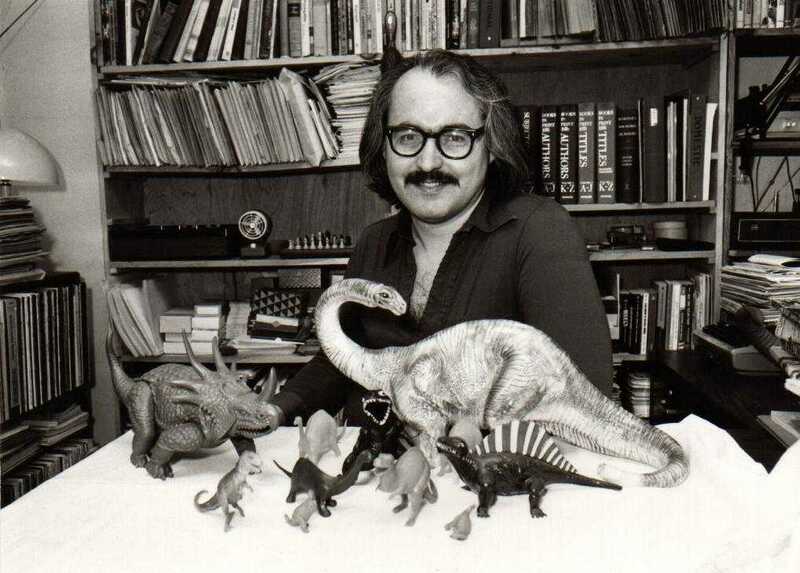 1982: "America's Top Dinosaur Hunter" by Tom Hanley, Collectibles Illustrated, July/August. Thorough albeit early coverage of my collection. Nowadays, of course, it's much bigger and fiercer. Great picture of me, too. Please think I still look like that. 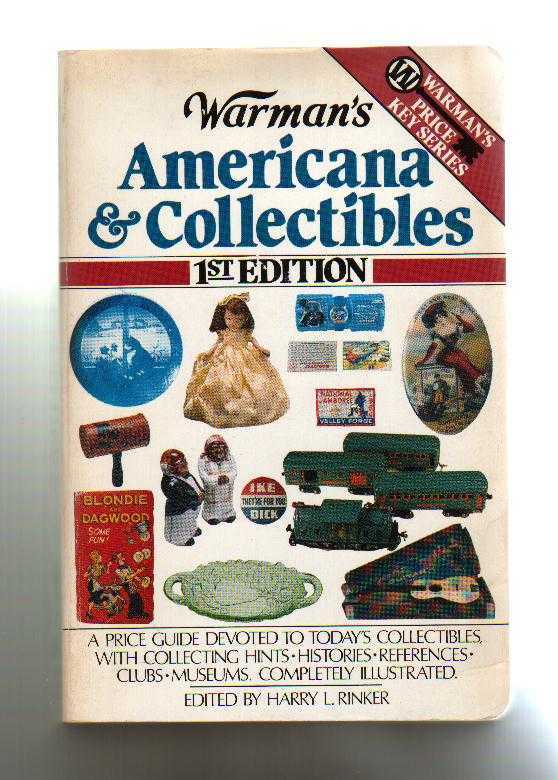 1984: "Dinosaur Collectibles" by Dean Hannotte, Warman's Americana & Collectibles. Still valid advice on how to start your own museum. 1989: "Here A Gronk, There A Gronk, Everywhere A Gronk Gronk" by Lenore Skenazy from her New York Daily News Sunday Magazine "Only in New York" column. Lousy title, great interview. 1990: "Dinosaurabilia: Saurians in Popular Culture", by Richard Milner, The Encyclopedia of Evolution. Nice to get credit for something once in awhile, even if it's just a word you made up. 1992: "Living With Dinosaurs: Inside the mind of a man who makes fantasy seem real" by Miriam Bensimhon, Life Magazine, October. After a three hour interview, Miriam quotes my opinion that dinosaurs were big. Nail it, Mir. 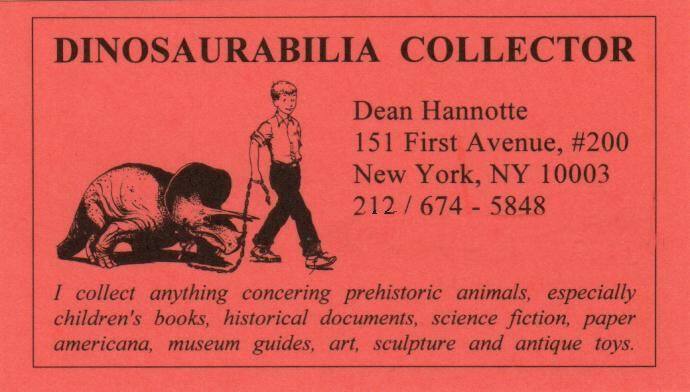 1992: "Dean Hannotte, Dinosaurabilia Collector", by Daniel and Susan Cohen, Where to Find Dinosaurs Today, Dutton. From an accurate and fun book by two of the best children's authors writing. Remember all those science fiction films where dinosaur-like monsters trampled Japanese cities; the comic book heroes who fought dinosaurs in timewarp battles, and the children's stories you used to read about the "friendly dinosaur"? Dean Hannotte remembers. Dinosaurs have played a big part in Hannotte's life ever since he received his first set of plastic prehistoric creatures as a gift at the age of ten. "I remember haunting the American Museum of Natural History as a kid, staring at the huge dinosaur skeletons for hours," the 34-year-old collector recalled. "I read all the books on paleontology I could find and sent in a mountain of cereal boxtops to receive dinosaur-related giveaways." Ten years ago Hannotte, an affable bachelor, decided to pick up where he had left off as a boy. "Dinosaurabilia" became his passion as he embarked on an odyssey through used book stores and flea markets in search of prehistoric creatures. "I'm more intrigued by man's fascination with the idea of prehistoric monsters than the actual creatures themselves," Hannotte explained. The results of that fascination fill his New York City apartment — which is literally crammed from floor to ceiling with dinosaur memorabilia. Included among the assemblage are more than 1000 books, as well as films, records, newspaper stories, postcards, puzzles and games, all with dinosaur themes. Over 300 dinosaur toys of all shapes and sizes can also be found in the collection, including a large red plastic tyrannosaurus with menacing teeth, produced by the Aurora model company. Hannotte purchased it from the back of a candy box in 1974 for $7.50. Motion pictures have often turned to dinosaur subjects in their quest to attract movie-goers. The first commercially successful animated feature was "Gertie the Dinosaur" (1909), a film short by cartoonist Winsor McKay. Among the dinosaur's great moments on the silver screen, Hannotte feels, was the 1925 film adaptation of Sir Arthur Conan Doyle's novel, "Lost World", and the 1931 classic "King Kong". Dinosaur battles in both films were produced under the guidance of legendary special-effects wizard Willis O'Brien. "The technical work behind the dinosaurs in these films remains far superior to anything else ever attempted. All the animals look like they stepped right out of paleontology books." Hannotte explained that dinosaurs first captured the American public's imagination in the 1880s and '90s, when fossil discoveries in the West touched off what Hannotte called "a bone rush." Newspaper headlines proclaiming new discoveries almost daily whipped fossil fever to a frenzy. "Even the American Museum of Natural History got into the act when it auctioned off a dinosaur egg for $5000 during the height of the craze," Hannotte said. The egg was found in the Gobi Desert, and when the Chinese government got word of the sale, it closed the desert to further exploration, keeping it off limits to archaeologists until the 1940s. Despite the dinosaur's place in American history and folklore, Hannotte stands virtually alone as a collector of dinosaurabilia. "I've yet to meet anyone else who collects the stuff on this scale," he stated. He is working to correct that. It is typical of him to send a visitor home with a shopping bag filled with duplicate dinosaur books, "just to start off their collection." In fact, books — comic books, pulps, magazines and hardcover volumes — make up the largest portion of the Hannotte dinosaur collection. Over the collector's bed, a tyrannosaurus crushes an armored tank on the cover of a pulp magazine of World War II vintage which reads: "Blitzkrieg in the Past." "I don't think there's any book on dinosaurs in the last 30 years that I don't have," Hannotte ventured to say. He has achieved this be regularly combing used book stores around Manhattan and keeping up correspondence with 300 book dealers around the country. Turning to specific titles on his shelves, he noted, "Here's the rarest book in my collection, a 1902 dinosaur takeoff on "Alice in Wonderland" called "Wonders in Monsterland." Other eye-catching titles stand out, such as "I Married a Dinosaur" and "Bring Them Back Petrified", both by Lillian Brown, wife of the late Barnum Brown, a noted paleontologist who made extensive expeditions in search of fossils. Comic books have long been fertile terrain for dinosaurs and Hannotte has accumulated boxes of them, including the popular "Turok, Son of Stone" series and DC Comics' "Star Spangled War Stories," in which dinosaurs battled with airplanes. "Even Mickey Mouse and Goofy went back on occasion to the prehistoric era," Hannotte said. One of the biggest producers of dinosaur items was the now defunct Sinclair Oil Company, which used a dinosaur for its corporate symbol. The friendly Sinclair brontosaurus appeared in advertisements as well as company literature, many of which have found their way into Hannotte's collection. "The company gave away dinosaur banks, jigsaw puzzles, stamp albums and inflatable toys," the collector said. Ironically, like the dinosaur, Sinclair was doomed to eventual extinction. The company logo disappeared in 1969 as a result of a merger with Atlantic Richfield. Dinosaurs have appeared on all sorts of media over the years. Unlike baseball cards, America never went in big for dinosaur trading cards. "The few available are quite expensive today, going for as much as $2 apiece," he said. One such series, consisting of 60 cards, was issued by Nucards Sales of Seaford, New York, in the early 1960s. "They're quite difficult to find," Hannotte explained. Foreign companies, on the other hand, have a history of producing dinosaur trading cards. Perhaps the most lavish set ever produced was issued by an Italian firm, Panini, in 1970. "The set contains 360 cards and are the largest I've ever seen," Hannotte remarked. "Precious" is the word the dinosaur collector uses when asked to assess the value of his collection. Hannotte figures he's spent at least $10,000 during the past decade acquiring his treasures. "But I really can't say what the value is," he admitted, explaining further that there is no one qualified to appraise such a collection. "Dinosaur memorabilia has not established its own market, simply because there's not enough people collecting the stuff. For example, dinosaur figurines done by Charles Knight, the premiere paleontologist artist in the country back in 1892, are in one sense very valuable, as they are hard to find. But on the other hand, it would be equally hard to find people who would want them in the first place." Hannotte has reached the point where his greatest pleasure comes in simply enjoying the items he has acquired. "I don't make quite as many extended forays to New Jersey book sales as I once did." He still maintains hope of someday finding others who share his appreciation for dinosaurabilia. "It's difficult to explain," Hannotte said. "All I know is that, for me, the hours spent combing racks on a bookstore ladder and getting crooked knees, just to have the thrill of finding an elusive dinosaur gem like "The Book of Prehistoric Animals", written in 1935 by Raymond Ditmars, keeper of the Bronx Zoo, are all worthwhile." Collecting Hints: Don't look at the National Gallery of Art, Sotheby's or any branch of Bloomingdale's. Do scout the corner candy store, the five and dime, Sunday comics, children's artwork and poetry, and Macy's toy department on Christmas eve. For dinoamericana of past decades raid flea markets, garage sales, church bazaars and book and antique dealers. With any luck you will soon have more dinosaur books, cards, clothes, coins, comics, figurines, films, glassware, jewelry, models, novelties, postcards, posters, promos, pulps, puzzles, slides, souvenirs, stamps and toys than you will know what to do with. History: Dinosaur collectibles, known as dinosaurabilia, are found in every nook and cranny of modern American culture. We are the only civilized nation to have erected a national monument to the dinosaur, though we did our best to hide it away in Utah. The dinosaur holds roughly the same place in the American mythos as does the dragon in Europe; but we seem to have taken this love affair to indecent extremes. Long before they can remember the names of five U.S. presidents, children of both genders routinely rattle off vital statistics of whole families of prehistoric reptiles, astounding their elders with Latin scientific names delivered trippingly on the tongue. The world's first dinosaur skeleton was described in 1858 by Dr. Joseph Leidy, curator of the Academy of Natural Sciences of Philadelphia. In the late 19th century, Edward Drinker Cope and Othniel Charles Marsh waged their celebrated war over the fossil fields of the West, making the dinosaur a household word. Fanciful exaggerated drawings of antediluvian monsters began usurping the space usually reserved for redskins on the warpath in all the Sunday supplements. Natural history museums began mounting complete skeletons in awe-inspiring poses, providing dramatic and concrete evidence for the idea of biological evolution. In no time at all the hucksters and capitalizers moved in, charging admission to fraudulent finds and selling worthless fragments of cattle bones for outrageous prices. Still, many interesting and valuable pieces of Americana survive from these hectic years in the form of museum postcards, newspaper clippings and, for the purist, airy scientific publications. In the 20th century, Hollywood rushed in where devils feared not to tread. Many allusions to prehistoric life can be found in the short subjects of the period, including those of D. W. Griffith. But it was not until 1925 that the first authentic classic of the paleocinema arrived in the form of Willis O'Brien's "The Lost World," followed in 1932 by O'Brien's "King Kong" with its lovingly crafted monsters based exclusively on the superb scientific illustrations of Charles R. Knight. The American public no longer had any doubts about its unofficial national mascot. O'Brien and his successor, Ray Harryhausen, have done more to fan the flames of international paleomania, and are better known, than all the dedicated paleontologists who made the original finds. Dinosaurs and their prehistoric friends had a foothold they would not begin to relinquish until spaceships began landing men on the moon. The term dinosaur, incidentally, refers only to land-dwelling reptiles. Anyone who collects dinosaur material also will be interested in flying reptiles, sea dwelling reptiles and prehistoric mammals, such as the mastodon the sabre-tooth tiger. For an authoritative account of the origin and evolution of modern dinosaurabilia, refer to The Dinosaur Scrapbook. References: Donald F. Glut, The Dinosaur Scrapbook, Citadel Press, 1980; Sylvia Massey Czerkas and Donald F. Glut, Dinosaurs, Mammoths and Cavemen: The Art of Charles R. Knight, Dutton, 1982; William Stout, illustrator, The Dinosaurs, Bantam, 1981. Also see books by L. B. Halstead, Britain's currently reigning king of the tyrant lizards. Periodical: News Bulletin, Society of Vertebrate Paleontology, Florida State Museum, University of Florida, Gainesville, FL 32611. Collectors Clubs: The Dinosaur Club, P.O. Box 164, Kingston Upon Thames, Surrey KT1 3SQ, England. Publishes The Dinosaur Times, quarterly; Dinosaur Nature Association, c/o Executive Secretary, Jensen, Utah 84035. Organized in 1956 to assist the National Park Service with educational activities at Dinosaur National Monument. Annual membership: $1.00, no benefits except membership card with stegosaurus printed on it; a group of German philatelists who specialize in paleontology, geology, mineralogy and speleology can be reached care of Johan Chr. van Soeren, Steinknock 3, 8520 Erlangen-Sieglitzhof, West Germany. Museums: Academy of Natural Sciences, Philadelphia, PA; American Museum of Natural History, New York, NY; Carnegie Museum of Natural History, Pittsburgh, PA; U. S. National Museum of Natural History, Smithsonian Institution, Washington, D.C. The Academy of Natural Sciences, under the direction of Hollister Knowlton, is assembling a new hall on dinosaur paleontology with special emphasis on the dinosaur's impact on popular culture as seen through the newspapers, science fiction, children's toys and other types of collectibles. Park: Dinosaur National Monument, Jensen, Utah. -- reprinted from Warman's Americana & Collectibles, 1984. Dinosaur scholars visiting New York journey first to the American Museum of Natural History, then speed down to East Ninth Street. There, in a cramped and cat fur-filled apartment, a genial man named Dean Hannotte introduces them to four friendly felines and one of the world's largest collections of dinosaurabilia — everything dinosauresque, except for (this is, after all, his apartment) skeletons. Dinos flowered in the land from about 200 million years ago to about 70 million years ago. In graspable city terms, that's a 130 million-year lease. By comparison, man's been renting here for a mere million and a half. "We're like a little experiment," chuckles Hannotte, in real life a computer programmer. "It's not clear if we're going to do well on this planet, but they were definitely survivors. The question is not why they died. It's 'What made them so successful?'" The answer, as with so many Mysteries of Life, lies in the Bronx. "My dad took me to see 'The Beast from 20,000 Fathoms' when I was about 6," recalls Parckchester-born Dean. "When the dinosaur came on, I was excited in a way I'd never been. I immediately ran to the bathroom and threw up." That's amore. Later on, the American Museum of Natural History played its role, too. The skeletons there also inspired several of his friends; one, Richie Mirissis of Staten Island, now boasts the world's largest collection of Godzillabilia. "We created our own fields," says Dean. "I dig in bookstores and thrift shops for my artifacts. I'm in touch with 500 collectors all over the world — Sweden, Europe, Japan. I'm as much an excavator as any paleontologist. I just do it on different sites." Scholars recognize amateur Dean as a bona fide expert: The Academy of Natural Sciences in Philadelphia invited him to consult on its "Discovering Dinosaurs" exhibit, slides from his collection were screened recently at our own American Museum of Natural History, and he's lectured at the prestigious (well, fun) Dinomania Festival at Dinosaur State Park in Connecticut. The search for real dinosaur relics began about 1870 in America, with fierce rivals Othniel Charles Marsh and Edward Drinker Cope "competing out west to find bones," reports Dean. "They were so competitive they'd blow up each other's finds and hire Indians to attack." At that time, "dino-mania became what dragon-mania is in Europe," Dean Explains. Until then, America didn't have a monster to call its own. "All the stories about dragons concerned European history. When dinosaurs were found in this country, we finally had our own beast." 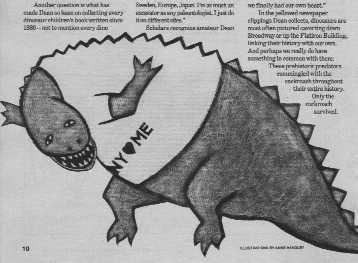 In the yellowed newspaper clippings Dean collects, dinosaurs are most often pictured cavorting down Broadway or up the Flatiron Building, linking their history with our own. And perhaps we really do have something in common with them: These prehistoric predators commingled with the cockroach throughout their entire history. Only the cockroach survived. in the New York Daily News Sunday Magazine. Two-hundred years ago no one had even heard of a dinosaur. Today children play with dinosaur toys, visit Dinosaur National Monument, even eat dinosaur-shaped breakfast cereals. During the 1980s a veritable explosion of dinosaur merchandising swept America, replacing Teddy bears and Disney characters as the most ubiquitous image in popular culture. 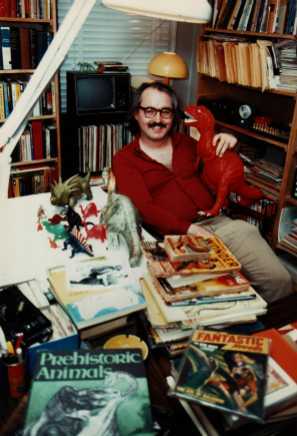 The term "Dinosaurabilia" was coined in 1980 by Dean Hannotte, a Manhattan computer expert whose passion is collecting anything connected with dinosaurs. Hannotte has assembled thousands of rare items, ranging from original paintings by Charles R. Knight (the father of dinosaur art) to early paleontological books, cereal premiums, toys, night lights, stereopticon slides, inflatables, jewelry, cards, models kits, neckties, pulp magazines, soaps and comic books. Among the quality collectibles are the line of Sinclair Oil Company premiums, glassware and stamp books issued at gas stations in the 1930s and 1950s with the company's "Dino" logo. Rare illustrated books by artists such as Knight and the Czech painter Zdenek Burian are also coveted, as are promotional materials from early dinosaur movies, including the original King Kong (1933), with its classic dinosaur scenes based on Knight's illustrations. The most authoritative account of the origin and evolution of dinosaurabilia is The Dinosaur Scrapbook (1980), written by Donald F. Glut, one of the world's champion collectors of Dinosaurabilia. -- reprinted from The Encyclopedia of Evolution, 1990. Dinosaurs are America's national monsters, as much a part of our historical mythology as dragons are to Europe's. Like so much that is American, this mythology is of fairly recent vintage, having its origins in that place where science meets pop culture. (Remember Godzilla? Or Sinclair Oil's Dino?) But relative newness doesn't limit our fascination with things dinosaurian. Paleontologists do their part — discovering, on average, a new dinosaur every seven weeks — and the media do theirs. Who can blame them? Peter Dodson, coeditor of The Dinosauria, claims "Slap a dinosaur on anything and it'll sell." And Sheryl Leach, who created PBS's Barney, admits that her dinosaur was originally a teddy bear. Then she took her son to a dinosaur exhibit. "I thought, 'Why not capiitalize on the appeal of dinosaurs?'" 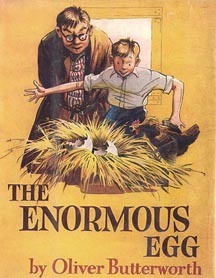 Cover of "The Enormous Egg"
But what is the appeal? "Dinosaurs remind us of our smallness," claims Michael Crichton, author of Jurassic Park, a novel in which dinosaurs are brought back to life. "It used to be that people saw the stars. Now people live in cities and are not reminded daily of their place in the universe. Dinosaurs give us that perspective. And anxiety about the environment translates into renewed interest." New York collector Dean Hannotte, who calls his assortment of stuff the Metropolitan Museum of Mesozoic Memorabilia, agrees: "You can't help but be struck in your soul by the gigantism of these animals." Perhaps that's why kids love dinosaurs — because they're big (and scary) like grown-ups. But Smithsonian paleontologist Michael Brett-Surman thinks it has to do with "Big, like power, not parents." San Francisco child psychologist Stevanne Auerbach seconds that. "Kinds can control and master scaled-down dinosaur toys, even though they know dinosaurs were much bigger." But Don Lessem, a writer who founded the Dinosaur Society, which raises money for dinosaur research and public education, says, "I prefer the simple explanation: Dinosaurs are neat." -- reprinted from the October 1992 issue of "Life Magazine". "Dinosaur scholars visiting New York journey first to the Museum of Natural History, then speed down to E. 9th Street. There, in a cramped and cat fur-filled apartment, a genial man named Dean Hannotte introduces them to four friendly felines and one of the world's largest collections of dinosaurabilia — everything dinosauresque, except for (this is, after all, his apartment) skeletons." So wrote Lenore Skenazy in The New York Daily News. Hannotte has been collecting dinosaur memorabilia since he was ten. Now his collection, which quite literally fills his apartment from floor to ceiling, includes over 1,000 books, as well as films, records, newspaper stories, postcards, puzzles and games with dinosaur themes. There are over 300 dinosaur toys, and a lot of advertising material from the old Sinclair Oil Company which used a Brontosaurus for its corporate symbol. "I'm more intrigued by man's fascination with the idea of prehistoric monsters than the actual creatures themselves," Hannotte explains. Though an amateur, Hannotte is considered not only an expert but the expert in the field of Dinosaurabilia, and has lectured and served as a consultant to prestigious institutions like the American Museum of Natural History and The Academy of Natural Sciences in Philadelphia. Hannotte loves to talk about his collection, and occasionally show it off. But remember, this is no museum open to the public, it's the man's apartment, so don't think you can just drop by. Call, or better still, write. You'll get an answer. -- reprinted from Where to Find Dinosaurs Today, Dutton, 1992. Tony: I first read about you in Daniel and Susan Cohen's book Where to Find the Dinosaurs. It said that you have the largest collection of dinosaur stuff anywhere. What exactly do you collect? Dean: I'll have to correct the Cohens! First of all, no private collector can compete with the major museums when it comes to dinosaur skeletons. 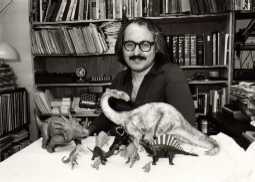 And Don Glut — the noted writer and lecturer who single-handedly started this whole modern dinosaur craze with his 1972 book The Dinosaur Dictionary — has an entire house full of dinosaur collectibles in California. What I MAY have is the largest dinosaur-related PAPER collection. I live in a NYC apartment, so I can only massively collect flat stuff: prints, art, posters, yellow journalism, letters, autographs. (Of course, there's no way to NOT collect books, so I make an exception there.) When Don first visited me in 1987 he inscribed a copy of his Dinosaur Scrapbook by writing "I hereby declare officially that your dinosaur paper collection is the biggest and most complete in the modern world." I'll defer to his opinion on this. Of course, John Lanzendorf has spent much more money on his hand-picked collection of original paintings and sculptures than I have on my stuff — but he and I have very different esthetic sensibilities. He's a very generous and warm human being, by the way. Tony: When did you start collecting? Dean: When I was a little kid my dad took me to see "The Beast from 20,000 Fathoms." When the "rhedosaur" showed up I got so excited that I ran to the men's room and threw up. I guess I've been star struck ever since. We started going to the American Museum of Natural History every Sunday and I'd beg to add another pamphlet or paperback to my growing collection of natural history literature. The one I really longed for was the paperback edition of Darwin. I couldn't understand it but I knew it contained an explanation for just everything. It was somewhere about this time that I started reading the dictionary for pleasure — I guess you could say I didn't have much of a social life! — and started using long words like "paleontologist" to confound my friends. I also memorized Bert Leston Taylor's funny 1911 lyric "Behold the Mighty Dinosaur" and amazed the hell out of my third grade teacher by reciting it at Show and Tell. Once I started getting a weekly allowance I'd spend my measily dollar every Saturday the same way: 15 cents on the subway going from the Bronx to the Fourth Avenue booksellers between 14th and 8th streets, 25 cents for a hot dog, 45 cents for used books, 15 cents for the ride home. That's how I found Roy Chapman Andrews' "Ends of the Earth" — all 35 cents worth — the very first book I ever read, which described the discovery in the Gobi desert of protoceratops eggs. And since I enjoy writing, I find myself even today making up words like dinosaurabiliac and sauropodiatry. How about "polypteradactylism: a rare condition in which an adopted pteradactyl is named Polly"? I also indulge in limericks, but I'll spare you those! Tony: What if any is your most prized piece in your collection and why does it have that distinction? Dean: Around 30 years ago I was amazed to learn that Charles R. Knight's daughter was living in NYC and didn't know any fans of her dad's work. We soon became famous friends and she told me many stories about her father's stormy relationship with Henry Fairfield Osborn. I was eventually fortunate enough to acquire over 200 original sketches of dinosaurs and other prehistoric animals that had lain in the Kennedy Gallery vaults for half a century. These alone are worth more in every sense than the entire rest of my collection put together. What I like best about them is that they're not finished works but rather let one into the mind of the artist as he tries out various interpretations of body posture and even facial expression. I also have two oils, one of which is shown in his biography, "Dinosaurs, Mammoths and Cavemen", and several mixed media studies. Tony: Wow! You primarily collect books on dinosaurs correct? How large is your library at this time? Dean: I own about 2,000 books on prehistoric animals, including children's books, biographies, science fiction, and museum guides. All in one NYC apartment with 6,000 more books on other topics. Help! Tony: As a primary collector of dinosaur literature do you share that unique library with anyone or any institutions? I'm thinking about how John Lanzendorf has had some of his incredible dinosaur art collection exhibit on display at the Field Museum in Chicago. Have you had opportunity to share your goodies as well? Dean: It's difficult for me to loan out even individual books to institutions, since complete strangers are going to need to touch them — and break their delicate spines! But I'm very open to people visiting and looking things up as long as they're not simultaneously eating peanut butter and jelly sandwiches. I'm in the NYC phone book so people know how to contact me, and I get visitors from as far away as Australia. Inviting people over to see what my friends call the "Metropolitan Museum of Mesozoic Memorabilia" is a lovely excuse for me to open up the Knight portfolios and lovingly drink in each masterpiece. He made genius look so effortless. With a few carefree lines he could capture the soul of a Brontotherium. You would believe that he had actually seen these beasts, they seem so massive and dangerous. I gently discourage most parents, however, who only want to rest their feet while Junior gets to wreck my toys. These days, with the internet, I'll be able over time to share much of my treasures with collectors all over the world, even those who can't visit museum exhibits. The first things that go up will be the Knight sketches. Tony: As you continue to collect is there anything you are still searching for? Has any prize eluded you thus far? Dean: Yes! Around the turn of the century the American Museum was selling copies of Charles Knight's dinosaur sculptures in the gift shop for $5 or so. I've seen pictures of these and even heard of one or two people who have seen and touched them. Yet I can't find any! But in a larger sense, I guess you could say I'm still looking for all those oddities that I simply am unaware of and so can't describe yet. I just know they're out there: the 1911 novel about the Chicago paleontologist and part-time crime solver, the 1946 comic about Roy Chapman Andrews, the lost Dadaist poem about T. Rex, Rembrandt's fabled sketch of dragon bones. These things, or things very much like them, must exist, no? I would love to learn about them and catalog them on my web site for the benefit of other collectors. Tony: In looking over your web site I noticed that you also collect quotes. I most enjoyed the section on quotes that you thought should be on t-shirts. One in particular caught my attention as I prepared to talk to you, a grand collector of things, "He who has the most toys dies anyway." What do you plan/hope to have done with your collection once you are, well, dead? Dean: It would be nice if everything were kept together as the "Dean Hannotte Dinosaur Collection" but I don't think it's important enough. My heirs will probably let it go in pieces, and it's really up to them. I can't think of any institution I'd like to give it to. The American Museum would toss most of it in those large dumpsters they keep out back. (I can't tell you what kinds of invaluable rarities staff members find just by peeking into those dumpsters!) It might be wiser to let each piece go to whoever would really give it a home for the next 20 or 30 years of its natural life. Is there, er, anything you'd like in particular, Tony? Tony: I didn't mean to sound "buzzardly"! Dean: Oh, I have nothing against scavenging. To evolution, a buzzard is a masterpiece of adaptation. And I can't tell you how many hours I've spent scouring the 100 or so used bookstores that are in Manhattan alone. And there's something especially buzzardly about collecting personal letters, isn't there? I have letters from Mrs. Roland Bird from when she was still editing her husband's autobiography — at least these were addressed to me. But I also have some letters by James M. Allen, who did watercolors for Sinclair Oil, and some letters by L. P. Gratacap, a nutcase from the American Museum who wrote wacky paleoanthropolical fiction — such as his 1906 "A Woman of the Ice Age." And speaking of wacky, please forgive me if I mention the little known fact that Charles H. Sternberg — yes, the famous fossil collector who spent years walking around the badlands that were "bad" in every sense — used to publish unintentionally humorous doggerel about the lives of the dinosaurs he was discovering. He wrote a 19-page masterpiece with the memorable title, "The Permian Beds of Texas". I only found my first copy last year. Tony: You say on your web site that you are more fascinated by man's interest in dinosaurs than the animals themselves. In your collecting and fascination, have you any insights as to why people of all ages from all around the world are so taken with these extinct creatures? Dean: Yes! They are gods come to earth. Primitive man objectified powerful forces into deities of various kinds, and monsters. He did this for so many thousands of years that E. O. Wilson, the Harvard sociobiologist, believes we may have a built-in genetic tendency to think this way. European pre-scientific theorists deduced the existence of dragons from dinosaur bones and cyclopses from mammoth skulls. When paleontologists told us that the object of our fears and dread were real animals from the past ages that could become a matter of objective observation, we became hooked. Not only were these "monsters" real, but they were safely dead and gone — thus children can enjoy their awe without fear. The discoveries of paleontology have filtered down to our "inner child" more in American than Europe, by the way, for the simple reason that our very own Cope and Marsh were big news on this side of the Atlantic for decades. For every European juvenile book about dragons there is an American juvenile book about dinosaurs. The dinosaur is America's mythic beast, just as Godzilla has become Japan's. It's also amazing to me how each age interprets the nature of these beasts within the framework of its own "zeitgeist". In a military culture, they are seen as warlike predators. In our laid-back post-modern hippie culture, they become John Horner's "good mother" Maiasaurus. I find especially curious the evolution of the first malevalent Godzilla into the friendly rubber squeeze toy he became a few years later. Tony: You have lectured and been a consultant to a couple of museums. What have you lectured on, consulted on, and how did these things come to happen? Dean: The Academy of Natural Sciences in Philadelphia heard about my collection when they were designing their new Discovering Dinosaurs hall in 1982 and asked me to serve on their advisory committee. Since they had a National Endowment for the Humanities grant to spend they had to have some "humanities" input to the process — and I qualified because I wasn't a professional scientist and I read a lot of comic books! Since I was a software architect by day I wrote a proposal to develop educational computer games that would use biosimulation algorithms to bring these beasts to life, but they clearly couldn't afford a project like that. All the ideas I wrote about became reality a decade later when Jurassic Park hit the screens. Also, one year the Dinosaur State Park in Connecticut asked me to give a slide talk for one of their Dinomania Festivals. And I've appeared several other times in other venues, but always in a very minor capacity. I prefer giving talks to children down the block from me at a little children's clothing store called "Dinosaur Hill." Pam, the owner, named it that because she grew up a few miles from Dinosaur Park in Rapid City, South Dakota where there are large dinosaur sculptures on a hill. Besides clothing, she sells dinosaur toys, dinosaur books, dinosaur games and dinosaur puzzles. Just my kind of place. Tony: What has been the greatest dinosaur reference book or any dinosaur book to come out in the last 50 years? Dean: Don Glut's are the best popular reference works, especially for the collector. His Dinosaur Scrapbook is a "must-read". But the last 50 years would also net Knight's Life Through the Ages, the fantastic trilogy by William E. Scheele — Prehistoric Animals, The First Mammals, and Prehistoric Man and the Primates — as well as all those coffee table books illustrated by the Czech master, Zdenek Burian. The 50's were something of a golden age, for this collector at least. Tony: I interviewed Dr. Colbert late last month and we discussed the fact that so many of the ideas getting press attention over the last few years are really rehashed (and sometimes not rehashed) old ideas. A lot of newer books are the same in that way to I think. What do you see future dinosaur book authors writing about? Dean: I couldn't agree more. The guys who write a lot of today's books are just rehashing what some other guy also rehashed. I actually had one art dealer try to sell me a photorealistic oil painting of a dinosaur. There was one problem. The "dinosaur" was an exact copy of the old Aurora T. Rex. The artist hadn't the slightest interest in the actual animals themselves, and certainly didn't want to inject any interpretations of his own — he was just ripping off some other artist. Don't get me wrong, I'm fond of the Aurora models as kitsch, but do I need expensive paintings of them? On the other hand, I especially liked Colagrande and Felder's In the Presence of Dinosaurs. There's an example of a great dinosaur book. Like "Walking with Dinosaurs", the emphasis here is on bringing these creatures back to life, not arguing about paleotrivia. A few years ago I was thrilled to be able to acquire Felder's highly original oil of a baby parasaurolophus. I call this piece "Duckling Bill". Of course, when it comes to future books I wouldn't mind seeing some novel science fiction, too. Tony: Did you know that the Smithsonian is revamping their Triceratops? They had a name the Triceratops contest for kids — winner to be announced in May with the kid whose name they chose to be there for the unveiling — I had some of my students enter the contest with the suggestion of the Triceratops that is on your collector's business card — Uncle Beazley from The Enormous Egg. I read that book to my kids every year and they love it. I'm anxious to see if the real thing will bare the name of the Triceratops that went to Washington. Dean: This is so ironic, Tony. For most of its life, the Smithsonian trike WAS named "Uncle Beazley". I have newspaper clippings somewhere identifying him as that. Guess they think nobody understands the reference anymore! Did you know that The Enormous Egg was an attack on McCarthyism? I met Oliver Butterworth before he died and he explained that he was making fun of the stuffy senators in Washington in the scene where they call Uncle Beazley an "un-American" animal. I told him a plot of a sequel I wanted to write and he gave me verbal permission to go ahead. And, yes, my sequel was to have been titled "Uncle Beazley". Oliver was an old English professor at a girls school by the time I met him. Much more interested in Francis Bacon and the origin of scientific method than dinosaurs per se. Tony: Have you met many authors of dinosaur material? Who did you enjoy most and why? Dean: I met Colbert briefly in the 80's and correspond with several others, but I can't claim intimate familiarity with any of them. I'm open to it, of course, but I seem to have more in common with collectors than PhD.'s. I CAN tell you that there are clearly two different kinds of paleontologists — those that don't approve of me, and those that playfully compete with me. Some of them take no joy whatever in their work and find it offensive that I read comic books about a serious scientific discipline. Whenever I'd visit Donald Baird at Princeton, however, I'd bring a shopping bag of treasures to show off. He'd have a similar hoard marching across his desk to best me. What fun we had! Tony: Do you have plans to write a book yourself? Dean: I have outlines of a number of books I'd like to write, but no time to work on them. I've been a webmaster in the dot-com world lately, and that means 50 work hours per week. I would mostly like to do a definitive bibliography called "The Amazing Story". Tony: And it would be about? Dean: If there is any single amazing story, surely the origin and evolution of life on earth is it. Most textbooks completely leave out the "amazing" part, though. Fortunately, the awe felt by non-scientists trying to share and understand these discoveries has left a "fossil" record all its own. I've read all of Prehistoric Times interviews with collectors of popular paleontology and, sadly, they only talk about the handful of books that are easy to find. For every book usually mentioned, there are a dozen glittering gems on my shelves that cry out to be better known. Maybe someday I'll have time to catalog them all. -- reprinted from Prehistoric Times No. 48, June/July 2001, pp. 49-51. This Paleo Ring site is owned by Dean Hannotte.